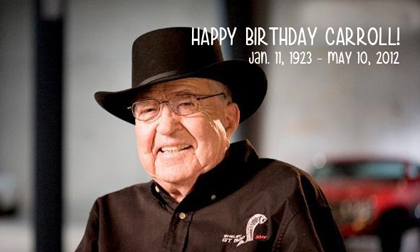 Today we celebrate Carroll Shelby, the iconic American race car driver and automotive performance manufacturer, who forever changed the landscape of American automotive performance. Carroll would have been 93 years old today. Persevere – Carroll never gave up. While on a trip through Dallas in 2011, Carroll stopped by our offices to talk shop and shoot the breeze. During that conversation, he reminisced about a particularly down time in his life. He talked about the time he was divorced, broke, out of a job and sleeping on the couch of his long-time friend, Bill Neale in Dallas. He told us that was a turning point his life. He dreamed of building both race and street cars in California and decided that he’d make a go of it in spite of his penniless situation. A world championship and thousands of cars later prove that he never let obstacles stand in his way. Think of others – Stories abound about how Carroll was a shrewd business man. Of course, we couldn’t agree more. You can’t go from being a bankrupt chicken farmer in East Texas to becoming a world-renowned automaker without a keen business sense. But Carroll never forgot his roots. His East Texas charm was the foundation of his mass appeal. Carroll showed that kindness to our team. In 2010, Carroll was attending the Barrett-Jackson West Palm Beach auction. At the time, we were Barrett-Jackson’s AOR and were there to support the event’s publicity efforts. When it was time to return home to Dallas, Carroll delayed his private jet. Why? So Scott could make it home a day early and not miss Easter morning with his two young sons. We are grateful for the chance we had to work with Carroll Shelby for almost a decade. He was not only our client, but a good friend. While he is missed, we are proud that we can be a part of keeping his legacy alive and a part of the conversation.